When it comes to picking the right colors for your home, finding colors that work together can be overwhelming. In addition to our skilled sales staff and designers who can guide you through the process, there are simple tips and tricks to make color selections easier. Using the Color Wheel can be a quick and easy way to know if certain colors will work together in a color scheme. Once you’ve decided what color scheme you like, you can then narrow down the countless options using online colors tools, like Sherwin Williams’ ColorSnap™. In the end, seeing is believing. Once you’ve narrowed down a few favorite colors, paint color samples in the space to see how they work together. Start with the Color Wheel. 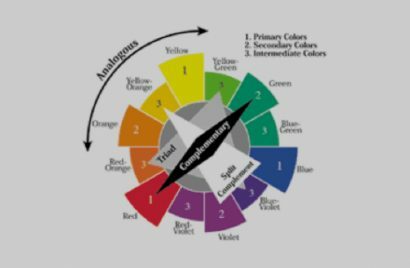 The color wheel is the standard diagram of primary, secondary, and tertiary colors. They can be simple 12 color wheels or complex wheels with varying shades and tints. It is always easier to start with the basics. The primary colors are Red, Yellow and Blue, often found in children’s toys because they are the most basic colors to recognize and occur most often in nature. Secondary colors include Orange, Green and Violet (Purple) and are created when two primary colors are mixed together. Tertiary colors are the combination of mixing a primary and a secondary color together. These include Yellow-Green, Blue-Green, Blue-Violet, Red-Violet, Red-Orange, and Yellow-Orange. Using this set of 12 colors, you can create Color Schemes. Color schemes are an excellent tool to organize and coordinate the millions of colors out there. Complementary colors appear across from each other on the color wheel and are either a combination of a primary and secondary colors, like red and green, or tertiary colors like Yellow-Orange and Blue-Violet. These colors always work well together and because they complement each other, often intensify in color when combined. A Triadic color scheme includes three colors evenly spaced on the color wheel, such as Orange, Green and Violet. An Analogous color scheme is a set of three (or more) colors directly adjacent to one another on the color wheel, like Orange, Yellow-Orange, and Yellow. There is also a Split Complementary color scheme that takes one color and uses the colors directly on either side of the complementary color. This would include a grouping such as Yellow, Blue-Violet and Red-Violet. Monochromatic colors schemes use one color, or hue, and uses varying shades (black has been added) or tints (white has been added). If you’ve found a color scheme you like but want more options for shades or tints, or if you have a hard time visualizing what the colors will look like together, an online tool like Sherwin-Williams’ ColorSnap Visualizer™ can help. With this online tool and mobile app, you have access to all of their colors and can pick from preselected images to “paint” a room scene. ColorSnap™ also allows you to upload your own photos so you can get a more realistic view of how the colors will look in your space. Whether you want to comb through all of their colors or if you know specific names, you can search their inventory and select up to 8 colors at one time to “paint” the trim, walls and accents. Each color also comes with recommend coordinating colors to make color selection even easier. If you create an account, you can save favorite colors, save room scenes you like, and even order samples straight from the website. So now that you’ve found a few favorites, its time to see it on the walls. Whether you order the samples online, or you go into your local store, its important to see the color in the space. Note that most samples come in a Satin finish. Most suppliers will have a sample board of the finish options to give you an idea of how matte or glossy the paint can look. Matte finishes hid imperfections in the walls better and are the choice for art gallery walls and all ceilings. Most trim is painted in a semi-gloss, where a satin or semi-matte finish is preferred for most residential walls. It’s important also to paint the samples in different areas of the room as light and shadow will play a big part in how the color looks on your walls throughout the day. The store fluorescents will not show you what it will look like in the ambient lighting of your living room or how it will darken with the absence of natural lighting. If you’ve selected one major color, one trim color, and one or two accent colors, paint them next to each other to ensure they all work together. At the end of the day, you know what makes you feel comfortable and happy in your home. Don’t go for what’s trendy or the “it” color, choose what you love because you’ll find you’ll come back to the same colors over and over again. Trust your instincts and know you can always repaint if you don’t love it. When it is all said and done and you still can’t decide, a local design or color expert is always happy to help in anyway. Our designers provide free initial design consultations for all customers when picking out tile or flooring and are happy to assist in the color selection process.